So my nest will be that design with one major difference: It will have an open top. So basically that nest but imagine the top part of the frame missing. I will just use a barrier of baby powder to keep my ants inside. This is so that I can connect the nest to an outworld without any drilling involved. 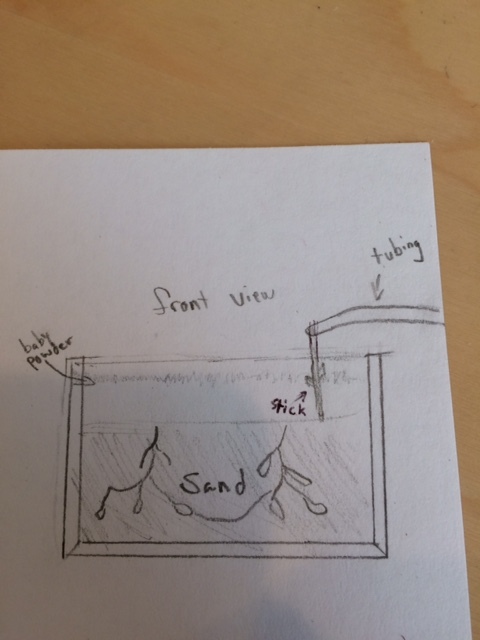 The plan is to plant a stick in the sand that touches neither side of glass, that somehow connects to tubing that runs down to my outworld and the colony's other nest. I know its really hard to envision, but it should work. I will be using an old plastic 8 by 10 picture frame. I will be using the glass that came with the frame (I will glue it in) Then I will get a sheet of glass or acrylic that is a bit larger (1/2 an inch on each side) and glue that to the back of the frame. there should be a 1/2 inch space between the two panes to put sand in. I figure that is a good width so that I can have a queen in it and she can turn around comfortably in her chamber, but also thin enough to encourage digging against the side of the glass. Like I said, it will be open topped so I can hydrate them easily. Hopefully I will figure out how to post pics when I begin working on it soon. Does anyone know what type of sand I should use? Aquarium ? play sand? Sand that says its for antfarms? I had very good luck with standard playground sand found at most hardware stores. It's not treated with anything (being playground sand for kids) and my Solenopsis seemed to like it. its a good medium for them to move around also. It sound like your doing some sort of bridge system using a stick and tubing? if so that's a cool idea. Do a drawing and post it to give us an idea of what your thinking of, you know a picture shows a lot, I do that a lot when I'm designing my 3D stuff I print. here we go. this is my design plan. Finally I have discovered how to post pictures! Last edited by idahoantgirl on Fri Jan 05, 2018 4:12 pm, edited 1 time in total. I like the concept, biggest thing is the barrier you'll need to setup where you transition from the stick to the tubing. Plan's on how to do this? Yeah... still working on that. One Idea is have is to have the tube connect to an outworld the same way that it connects to my nest. In which case, it wouldn't have to be tubing at all. It could be wire or something like that. The only downside to this idea is that the queen wont be moved in, which would have been cool to have seen. Idea # 2 would mean that I couldn't mount it on a wall. The back panel is acrylic, which would be easy to drill a hole for tubing into. Like I said, this would eliminate the possibility of hanging it on a wall though which would be a bummer. I will be posting step by step photos soon.